- BUILT IN THE U.S.A. ! We have these Superbly Crafted Putters IN STOCK NOW. BAM!!! VERY POPULAR STYLE!! 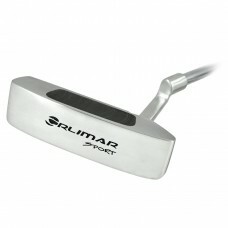 "MY FIRST ROUND WITH THIS PUTTER WAS A HILLY COURSE IN VIRGINIA; 18 HOLES AND NO 3 PUTTS"!! "Designed as one of the follow ups to the original Ping 1A putter, this is a simple but highly effective putter which was revolutionary in its design. It was the first putter to have a cavity hollowed out in its back. This has the effect of distributing much of the weight of the putter head to the heel and toe ends, which makes the sweet spot larger. Because of this you get far less twisting of the face on an off center strike and this makes it one of the most forgiving golf putter types". * The FIRELINE Putter Uses a Full Offset Hosel for Increased Feel and Consistency. * The Contoured Soft Touch Putter Grip Increases Feel on the Green. * Line Alignment System Helps Improve Accuracy. * The Face is Precision balanced for consistent connection with the ball. Arc Milled face with Insert controls spin and feel of the blade for a more true "Roll"
* Polished finish reduces glare..
....."There is NO DOUBT that the Offset Hosel and -Line alignment design with this Flange putter head makes lining up your putts simple and accurate". AGXGOLF is headquartered in Michigan and we build these fine clubs right here in our Highland Michigan shop! We hope you enjoy playing these fine golf clubs as much as we enjoy crafting them! And we GUARANTEE that you will be SATISFIED! !